At Black Hat USA 2015 this summer (2015), I spoke about the danger in having Kerberos Unconstrained Delegation configured in the environment. When Active Directory was first released with Windows 2000 Server, Microsoft had to provide a simple mechanism to support scenarios where a user authenticates to a Web Server via Kerberos and needs to update records on a back-end database server on behalf of the user. 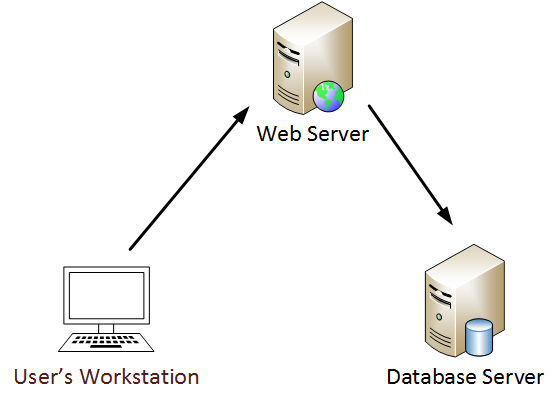 This is typically referred to as the “Kerberos double-hop issue” and requires delegation in order for the Web Server to impersonate the user when modifying database records. Microsoft implemented Kerberos “unconstrained delegation” in Windows 2000 that enables this level of delegation. A Domain Admin can enable this delegation level by checking the middle box. The third box is for “constrained delegation” which requires listing of specific Kerberos services on computers to which delegation is enabled. Discovering computers with Kerberos unconstrained delegation is fairly easy using the Active Directory PowerShell module cmdlet, Get-ADComputer. How does Kerberos Unconstrained Delegation really work? Let’s follow the standard Kerberos communication flow. 5. The user connects to the server hosting the service on the appropriate port & presents the TGS (AP-REQ). The service opens the TGS ticket using its NTLM password hash. When Kerberos Unconstrained Delegation is enabled on the server hosting the service specified in the Service Principal Name referenced in the TGS-REQ (step 3), the Domain Controller the DC places a copy of the user’s TGT into the service ticket. 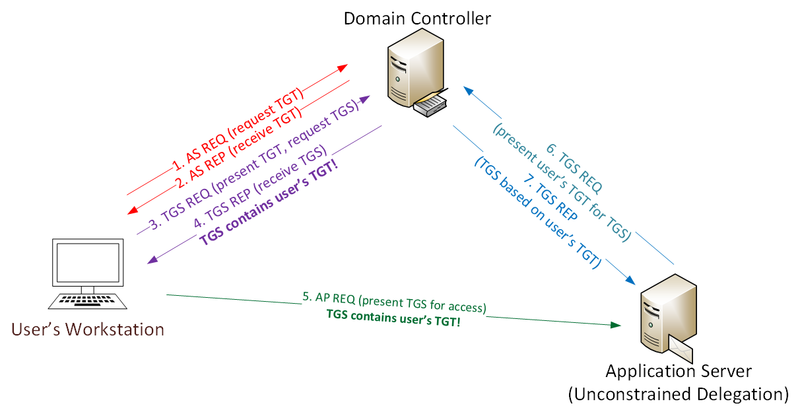 When the user’s service ticket (TGS) is provided to the server for service access, the server opens the TGS and places the user’s TGT into LSASS for later use. The Application Server can now impersonate that user without limitation! NOTE: In order for an application server to be configured with “Kerberos Unconstrained Delegation”, a Domain or Enterprise Admin needs to configure this setting on the computer account in the domain. This permission can be delegated to other groups, so be careful who has this right in Active Directory. As an attacker, once you have found a server with Kerberos Unconstrained Delegation, what’s next? Compromise the server via an admin or service account. Social engineer a Domain Admin to connect to any service on the server with unconstrained delegation. When the admin connects to this service, the admin’s TGS service ticket (with the TGT) is delivered to the server and placed into LSASS in case it’s needed later. The Domain Admin’s authentication (TGT) ticket can be extracted and re-used (until the ticket lifetime expires). No need to wait though, the ticket can be used immediately in order to get the domain KRBTGT account password hash (when a Domain Admin is compromised). In this case we use PowerShell remoting to connect to a Domain Controller as the Domain Admin. Don’t use Kerberos Unconstrained Delegation – configure servers that require delegation with Constrained Delegation. Configure all elevated administrator accounts to be “Account is sensitive and cannot be delegated”. 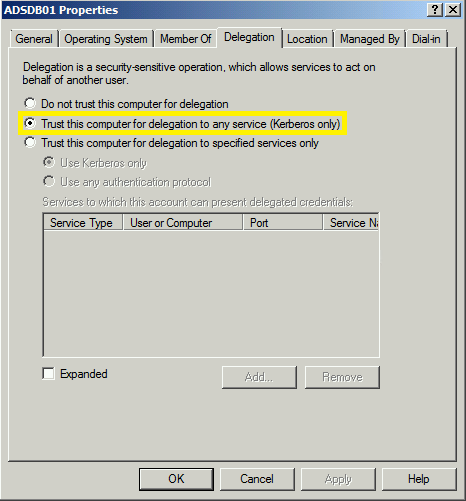 The “Protected Users” group, available starting with Windows Server 2012 R2 Domain Functional Level also mitigates against this issue since delegation is not allowed for accounts in this group. Protected users would work because by default it does prevent constrained delegation however it requires Kerberos. Most people don’t think of this but many RDP connections are established using NTLM. If you don’t have a proper PKI in place that leverages certificates for RDP you force those protected accounts to only be able to log in locally. Since protected user accts are typically service accounts this isn’t an issue but it’s something to think about before you start throwing accounts in to that group.